NICASTRO LAW, L.L.C. - I. CONTACT US /DIRECTIONSdDi Our live operators are standing by 24/7 waiting to service you. Do not hesitate to call us anytime. Our live operators are standing by 24/7 waiting to service you. Do not hesitate to call us anytime. YOU DO NOT BECOME A CLIENT OF NICASTRO LAW BY SENDING AN EMPLOYEE OF THE FIRM OR ANYONE AT THE FIRM AN EMAIL OR A LETTER. PLEASE SEE OUR LEGAL DISCLOSURE PAGE FOR MORE DETAILED INFORMATION BY CLICKING HERE. As a special incentive and benefit to "You" our potential client, if you retain NICASTRO LAW, L.L.C., for representation of your case at the time of your very first consulation, and mention this advertisement, you will receive a 10% discount off of our current hourly rate on future services connected with your case. So long as you bring this to our attention at the first consultation, we can add it to our billing database. This will then be reflected in your contract with us signed on the day of that consultation. This cannot be combined with any other offers. At 1.3 miles on Centre Street you will come to a Rotary; There is a 7/11 STORE on your right as you approach the rotary; then the West Roxbury Police Station is on the right as you are going around the rotary; at ½ way around the rotary, you will see Holy Name Church—take the right so that the church with the large green and gold “Holy Name Church” IS ON YOUR LEFT: Keep the church on your left as you pass it; if you take the turn putting holy name on your right, you have gone too far around the rotary. You are technically going straight across the rotary and staying on Centre Street. STAY ON CENTRE STREET, going across the rotary; this part of the trip is .1 mile from the rotary;You will come to a light which is South Street; the next street on your right should be Guernsey; after that you will come to Ainsworth Street. 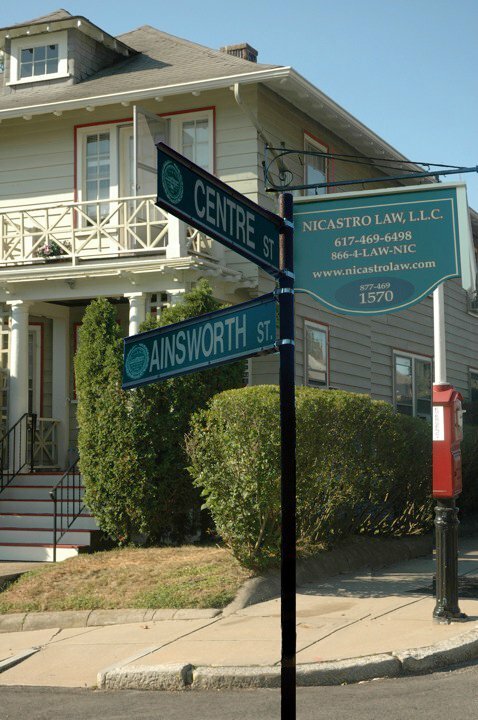 We are on the corner of Ainsworth and Centre Street; there is a Law Office sign outside the office. Take the right turn; we are at the corner #62. At Forest Hills Station take Bus No. 38, which has a marker as “WREN STREET” to the intersection of Centre Street and Montclair Street in Roslindale. This stop is directly across the street from our office at 1570 CENTRE STREET, which is at the intersection of Ainsworth Street; enter office at 62 Ainsworth Street, Roslindale, Floor 1, entrance. Take the Needham Line on the Commuter Rail to Bellevue stop; Walk up Guernsey about two ½ blocks and our back door is the last building on Guernsey; walk to the front door; and ring the office bell. We are 14 minutes from Back Bay station by train. Our Roslindale office is located at the Roslindale/West Roxbury line. 62 Ainsworth Street is at the corner of 1570 Centre Street in Roslindale. We are .3 of a mile from the West Roxbury Police Station and the Holy Name Church heading in the direction toward Faulkner Hospital on Centre Street. Please tell us any suggestions you have on how we can improve our website to make it easier for you.